Photo shows a sampling of slick-line products from Sedcotech-uds-i. Loh (right) is seen during a photo call with Sedcotech-uds-i director Stuart Johnstone. 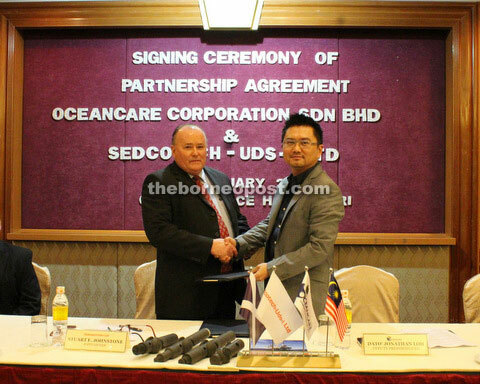 MIRI: Oil and gas company Oceancare Corporation Sdn Bhd signed a partnership agreement with Sedcotech-uds-i Ltd on Monday to bring in automated slick-line technology. CEO Datuk Jonathan Loh said as a Sarawakian company, it was an honour to be selected by Scottish company Sedcotech-uds-i to bring this form of automated slick-line technology to the local market. “Today marks another important milestone for our company as we come together to begin a new journey as a united force in the oil and gas industry here in Malaysia,” he said. Loh said Oceancare Corporation would not only provide service as a contractor but also be actively involved in training oil and gas personnel as well as in manufacturing slick-line products. He said the company recently entered into an agreement with the Ministry of Youth and Sports and the National Youth Skills Institute (IKBN) to set up the Oceancare Technical Training Centre here. “The purpose of this centre is not only to train and upgrade current personnel in the field but also to bring about a training programme for the youth of Sarawak, to enhance and skill them with the right work skills and technical know-how so that the can be the future workforce not only in the oil and gas industry but other related industries as well,” he explained. 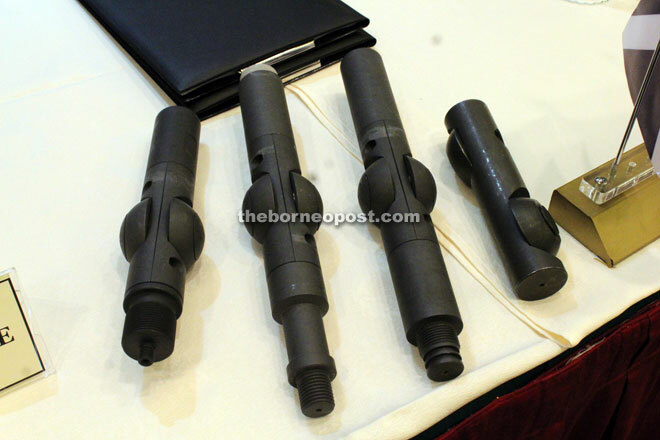 Although a foreign company, Loh said Sedcotech-uds-i has shown commitment towards the people of Sarawak and is willing to invest in them for the future as it is also the vision of Oceancare Corporation to assemble Scottish slick-line products in Sarawak to create more job opportunities for the local workforce. “As CEO of Oceancare Corporation, it is with great optimism and positive mindset that my team and our new-found partner will not only bring this slick-line technology in the Malaysian market but represent a form of cost effectiveness benefiting the oil and gas industry as a whole in the long run,” he said.